Prices for all types of hay lost ground during August, according to USDA’s most recent Agricultural Prices report released last week. The all-hay price for August was pegged at $136 per ton, which was down $7 per ton from July but still $6 higher than August 2016. 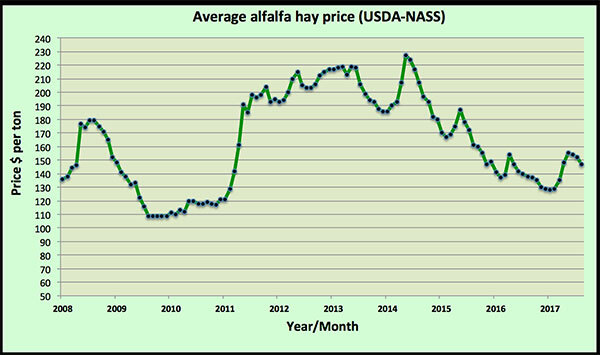 Hay other than alfalfa dipped $10 per ton in August to $116, which equals the August 2016 price. The August alfalfa hay price was $147 per ton, $5 lower than July but $10 per ton over the 2016 level. The alfalfa price remains $19 above the low of $128 per ton set in January. Looking at the past 10 years of USDA alfalfa price data, the August price has never moved higher than the July price. The leading alfalfa price gainers in August were New York (plus $10 per ton), drought-stricken Montana (plus $10), Kansas (plus $8), and another moisture-challenged state, North Dakota (plus $8). 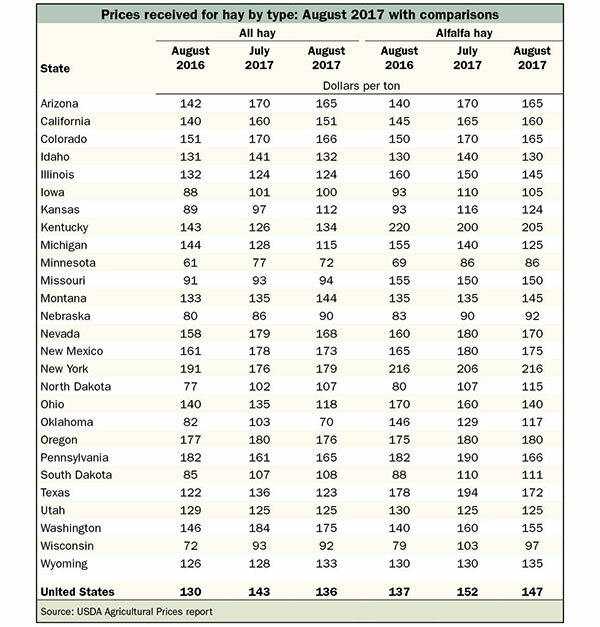 Pennsylvania led price losers at minus $24 per ton followed by Texas (minus $22), Ohio (minus $20), and Michigan (minus $15). The highest alfalfa hay prices are being reported from New York ($216 per ton), Kentucky ($205 per ton), Texas ($194 per ton), and Oregon ($180 per ton). For the second month in a row, the lowest prices can be found in Minnesota ($86 per ton), Nebraska ($92 per ton), and Wisconsin ($97 per ton).